The Egyptian Musk Sandalwood soap recipe is heavenly!!! Mostly it is the Egyptian Musk. That bar was absolutely hands down our best selling scent. Unfortunately, there are about 20 scents with this exact name. If you ever find that elusive scent, you can delete the Sandalwood and add about half more scent with the Egyptian Musk. The musk scent is probably 50% stronger than the Sandalwood. 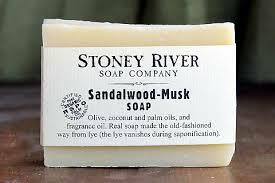 When making this soap, consider that this musky fragrance of any kind is the worse scent you can get regarding the added chemicals and parabans needed to manufacturer it in the lab. Having said that, we had a customer in the store that only wanted the natural soaps, we showed her how the basket labels indicted which were all natural, half natural and half synthetic, and all synthetic. Needless to say, after she smelled lots of them, she left with the toxic musk – we even pointed out that it wasn’t a natural scent! And this happened alot! People wanted natural, and left with the aromatic and perfume type scents. 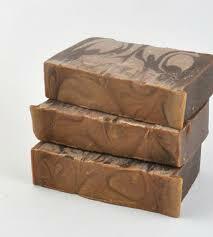 1 1/2 tsp cocoa powder in another one cup of soap base, mixed thoroughly, then drizzled on top in order to make a swirl. The below image is another great way to make your soap, with no color. The scent itself would perhaps in nature not have a color, so this would work well too. 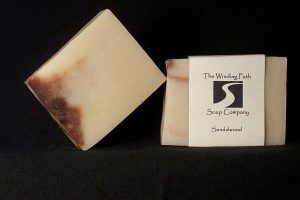 I thought that this was a theme-type bar, with the name “Egyptian Musk & Sandalwood”, so I attempted to keep the color reminiscent of sand, (from Egypt) and the swirl was representative of the Sandalwood. My soap is at the top of this page. Find out why sandalwood essential oil is so expensive, it’s difficult to process, more here at Wikipedia.